Home » Tips and Tricks » When, where and how often should you clean your car? When, where and how often should you clean your car? A car is probably one of the most important purchases we will ever make. Whether you are buying or leasing a vehicle, it’s important to keep it in great condition so that it can do its job: namely getting drivers, passengers and cargo safety from place to place. If you are wondering “When should I wash my car?” or about other details of car cleaning, this post may clear up some of your questions. You May Like: How often should I rotate my tires? When should I wash my car? The simple answer to “When should I wash my car?” is “When it’s dirty!” However, vehicle owners may be surprised to learn how often that may be. You shouldn’t only be washing your car when there is too much grime on the windows to see through. Things like bugs, tree sap and pollution can hurt your paint, which can ultimately lead to body damage if you let it go too long. It’s a good idea to wash a car once a month if it is being used regularly, and more often if you live in an area with lots of contaminants. What kinds of things can damage my exterior paint? Especially in the extreme heat of Texas, it can be important to get bugs and debris off of your car before they can bake onto the paint. Removing things like squished insects, tree sap, bird droppings and air pollution residue is easier when you wash it off right away. Trying to scrub these things off later can actually take off the top layer of your paint, which might lead to rust and other damage later. If you live in an area where you car regularly gets covered in these things, then it might be a good idea to wash your car twice a month or even once week. Should I wash my car by hand or at a car wash? 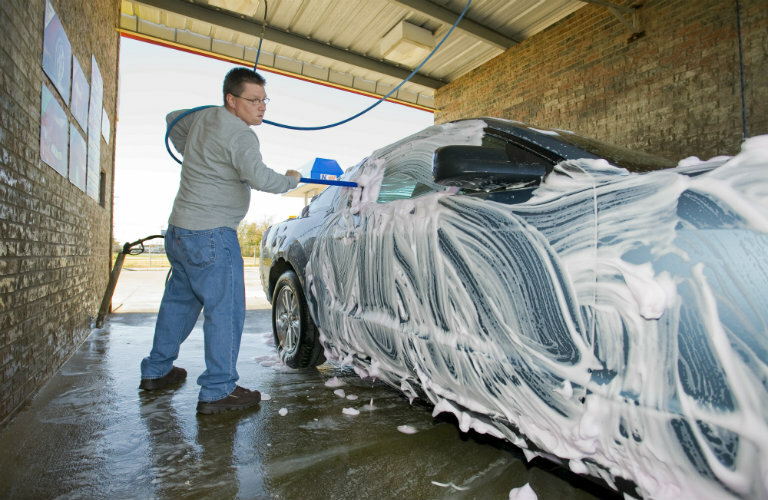 Washing a car by hand or at a car wash is up to the individual person. Automated car washes to a very good job getting a vehicle clean, and take a LOT less time than washing a vehicle by hand. However, either option is fine (though be sure you are using the right kind of soap and brushes when you are cleaning a car by hand, and always turn the water off between rinses to conserve water). This entry was posted on Monday, July 31st, 2017 at 9:01 pm	and is filed under Tips and Tricks. You can follow any responses to this entry through the RSS 2.0 feed. You can skip to the end and leave a response. Pinging is currently not allowed.